On Sunday, the 14th Annual Kamloops Bridal Fair took place in the TRU Campus Activity Centre. The event was planned by the TRU Conference Centre and Brielle Hwalstad was the leading coordinator of the event. 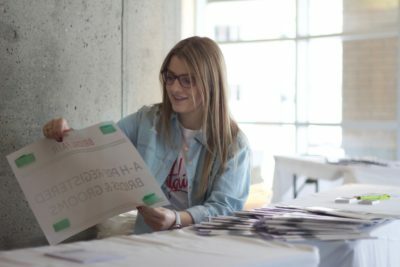 Although Thompson Rivers University isn’t the full force behind the bridal fair, it does provide the fair with much of its help. For the past 14 years, the bridal fair has taken place within the CAC and will continue to do so in the future. Although the fair has been sold out to vendors the last three years, with a trailing waitlist behind them, they will not move the location. This is because TRU offers the space to the TRU Conference Centre at no cost. By hosting the event in the CAC, the TRU Conference Centre has the opportunity to save some money, as well as to show off the building as a potential wedding venue. The bridal fair is also very helpful to the students at TRU, especially those needing volunteer and/or work experience. The TRU Conference Centre hires three students in late August to fulfill different coordinating roles. The students this year included Stephanie Tate, Volunteer Coordinator, Jessica Cooper, Fashion Show Coordinator and Jordyn McCrea, Marketing Coordinator. Hwalstad noted that they regularly have upwards of 25 TRU student volunteers each year. The PCMA (Professional Convention Management Association) club, a TRUSU club, also regularly volunteer, as the club helps students gain real-world experience in the event planning and tourism industry. All volunteers and employees are TRU students. TRU gives back to the fair, just as much as the fair helps TRU and its students. Hwalstad acknowledged that TRU Facilities are an important contributor to the event, as they make sure doors are opened and unlocked, provide extra garbage cans and signage and help regulate the temperature due to the extra traffic of people. Hwalstad also mentioned the Print Shop on campus as a contributor to the fair, which does its part by making posters and signage for the event. Over 1000 people come in and out of the Campus Activity Centre during this event, which goes to show how large and indispensable all volunteers and workers are to the fair. Hwalstad says that the bridal fair was originally created because the TRU Conference Centre wanted to unite all the different bridal sectors in Kamloops and says that it created a “One-stop shop event” for couples planning their big day. Hwalstad hopes that the fair continues to sell out and that more couples continue to see what Kamloops has to offer in terms of their wedding, as well as to provide fresh content each coming year.